This product is not to be used as a pool fence. This is meant to be a visual deterrent to vehicles - deterring unwanted entry to your driveway while your kids are playing in it. It will not prevent children from going over, under or around the driveway guard. Do you ever worry about your child's safety when they are riding their bikes, or even just playing in the driveway? So many people just pull into your driveway without even taking a second to see if children are around. Put your mind at ease with Kidkusion's Kid Safe Driveway Guard. This JPMA award winning product was shown in Parenting Magazine. 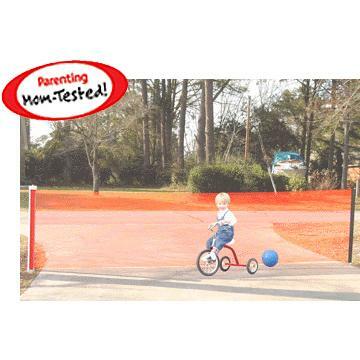 The Kid Safe Driveway Guard is safe for your child as well as drivers. Available in 18feet or 25feet, it's color is bright orange so it's easily seen. Included are a retractable net with pole, and two ground sleeves. The Kid Safe Driveway Guard is 36" high, and removes for easy storage. The best part is that when your ready to use your driveway the net retracts like a tape measurer, so it's easy to put out of your way. Kidkusion has been developing innovative child safety products since 1991. Every item is developed and tested by moms and dads just like you! So make it safe for your children to play in the driveway and order you Kid Safe Driveway Guard today. Q. Is the Kid Safe Driveway Guard easy to install? A. Yes! It installs in seconds so it's ready for use. Q.What if my driveway measures wider than 25 feet? A. You will need to use two units that will extend out and meet in the middle. Q. How do I install two units side by side? A. Using a 1 and 1/8 masonry drill bit, drill into the center of your driveway, and mount two ground sleeves side by side. Q. What do I do when I want to use my driveway? A.Easy!The Kid Safe Driveway Guard retracts like a tape measurer. Just pull and go. Q. Is it easy to see? How tall is the Driveway Guard? Q. What is the JPMA? A. JPMA stands for The Juvenile Products Manufacturers Association. Q. Who manufacturers this product? A. Kidkusion! A company that has been developing child safe products since 1991.